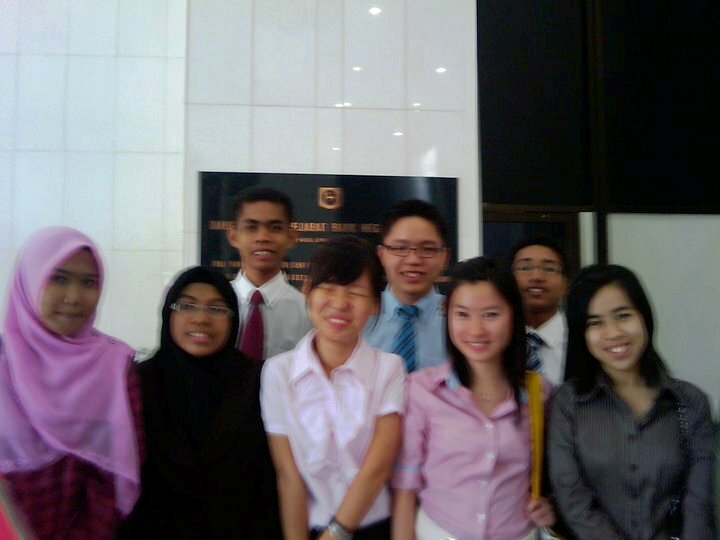 Let us continue with my interview experience in BNM last Monday. Oh wow, time does fly right? A week just passed by without noticing much on it. This post is going to be extremely lengthy, and you can stop here if you don't want to proceed. Okay, let me start telling the whole experiences here in the deceivingly old yet technologically advanced BNM Headquarter in front of Jalan Kuching, KL. At 6am, I woke up with a pretty nervous mode cause I would be having an interview that day, and I started to recall back everything that I had practiced on. The Malay essays phrases, the answers for common questions, and my future plan. Everything. Lazily and reluctantly I had to wake up from my bed, and started to prepare fast. Making sure everything was smart and tidy, and my file with a bunch of certs were prepared, at 6.30am, my mom drove me down to BNM building in KL, and unexpectedly the traffic was quite heavy at the KL-Seremban Highway. The Perodua Myvi that my mom drove just slowly crawled towards the destination, and I thought that I would be late for the interview. Fortunately, the traffic congestion gradually recovered and the Myvi could easily run at 60km/h, not bad i think. 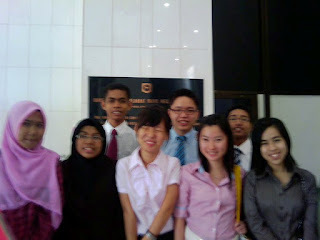 At 7.20am, I had reached the BNM building. A very familiar building, where my dad used to bring me here for the past two years, during pulang bermalam on Friday, once a month. I used to leave my school(ASiS) on Friday afternoon(1pm) and head to BNM headquarter as my dad was working there. For me, I used to spend my time there in the BNM's library surfing the Internet, while waiting for my dad to finish his job at 5pm. My mom parked the car at the car park inside the BNM building and walked along into the old block, where I found lots of candidates(with their parents) were already waiting there patiently, and they seemed to be nervous too. Like me, I bet everyone was having the same feeling on that particular time. Not long after I registered my name at the counter, a petite guy named Mr. Mohd Suapi, introduced himself to all of the candidates and stated that he was the coordinator for the scholarship department. Later, he brought everyone of us to the BNM's cafeteria for our breakfast, and from there we have to separate with our beloved parents. Got some wishes and luck from my mom, every candidate including me started to follow Mr Mohd Suapi to the cafeteria. Amazingly, the cafeteria was classy like 5-star restaurant, and everyone seemed to fall in love with it. Well, I have had been to the cafeteria for quite a number of times, so I was not that obsessed with the cafeteria like the other candidates. Most of them was there for the first time, and everyone started to praise the beauty of the cafeteria. Classy, glassy and posh. Everything. One technology that I wish to compliment on was the usage of the high-tech machine at the pay counter, in which it was used by the staffs to pay for their food, cashless. The staff would have to show his/her staff card, and the price of the foods bought would be credited from the monthly salary. Quite advanced, right? Alright, back to the story, all the candidates sat down at the tables, with the crispy roti canai and a cup of hot teh tarik put in front of every candidate. Everyone was awkward for not knowing each other, and started to introduce themselves and meet new friends. From what I had observed, everyone of them was great and smart, and from there I realised that the competition to secure the scholarship would be really stiff. They were all quite amicable, and we had talked a lot about education and the interview, to relieve our stress and nervousness. 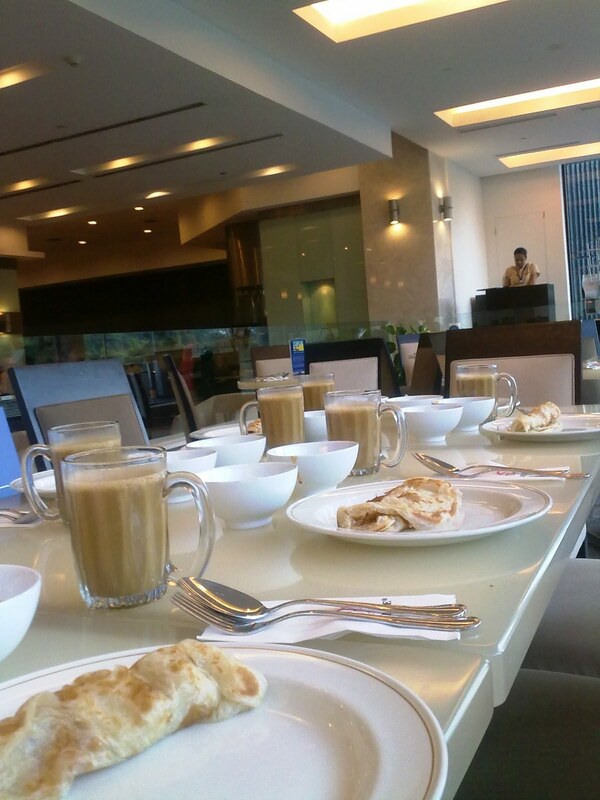 Here it is, the crispy roti canai and cups of hot teh tarik!!! Some of them have already started their studies(A-Levels and Ausmat) in the private colleges, for January intake or March intake, to prevent time wasting at home doing nothing (like me. =.=). After chatting for a few minutes, our coordinator Mr. Mohd Suapi greeted us and invited us to have our breakfast. Then only everyone started to enjoy the meal. We were then given a tag with particular color indicating respective group and the name stated above; And my tag color was PURPLE!!! My favourite color, coincidently. 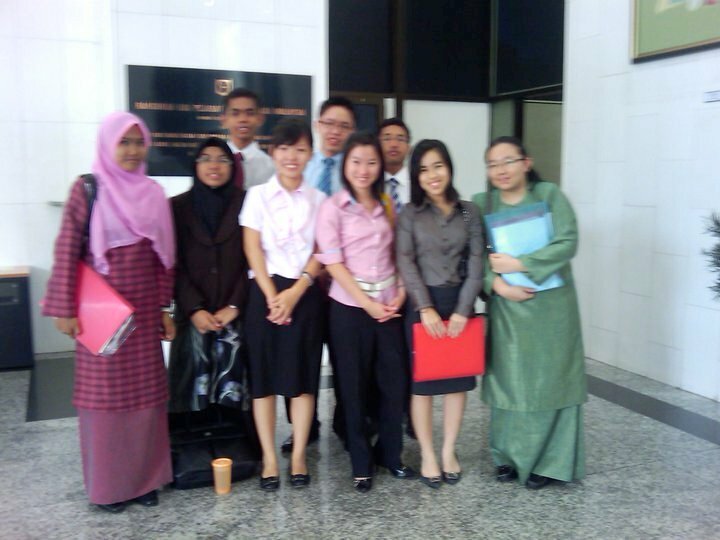 Next, my group members and I were introduced to our facilitator, Mr Mahathir(hope to spell his name correctly), and he led us to the Knowledge Management Centre at the first floor of the old building to prepare for our interview sessions. Unexpectedly, the Knowledge Management Centre was the library, where I used to go for the past two years, to spend my time there surfing Internet while waiting for my dad to finish his job. Gosh, it was really an unexpected venue, for I was going to determine my future there- The exact place for me to surf Internet those days. Yes yes, it's here!!! The Knowledge Management Centre!!! Next, our interview sessions started. There were 4 essential parts which everyone of us must go through - Individual Presentation, Individual Interview, Essays writing and Group Presentation <--- The arrangement of the parts was like that, in my case. *points there* But it's not really important, anyway. Thirdly, it was Essays Writing part. I was given a paper with 4 questions on it, and I was required to write two essays from the four questions stated, one for each language(English and Malay). For only an hour was allocated for this part, I had to speed writing my essays and the handwriting apparently seemed untidy and hideous. Hopefully the markers won't care much on the handwriting. Fortunately, I was able to finish it on time, and hopefully I did well in this part. The proof of the generosity of BNM! 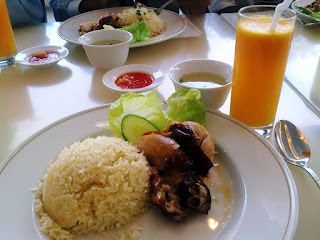 The scrumptious chicken rice with a glass of orange juice besides!!! When the Muslims friends came back, we continued our interview sessions, which was the last part- Group Presentation. 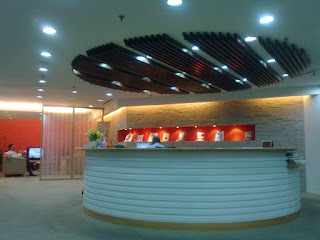 We were brought to the Human Resources Department, where there was a meeting room inside. We went in there, and we were then given a question paper each, with a few Mahjong papers and a few marker pens. Due to the excessive number of group members, we were separated into two groups. My group was consist of 5 members, including me. This part was like a a group presentation, or more precisely, roles acted. I was elected as the project manager for my group, and everyone started to play his/her role chosen and planned about the project. When the presentation was about to start, I went BLANK and had to take a glance on the Mahjong paper to remind me on what I was going to say. Unfortunately, cause my group was the first group to present, we had less time to discuss about everything, approximately 30 minutes. Unlike the second group, they had more time to discuss outside the meeting room while my group was presenting. I stuck when I was about to introduce the objective of the project, and it took me about 10 seconds to think about it and say it out. Gosh, I was like, OMG!!! What happened to me??? >.< Nevertheless, I think it was because of the tiredness that was so overwhelming at the time, cause it was 3.30pm in the evening, and practically i just couldn't think anything. My brain was stuck!!! What a group leader I was. 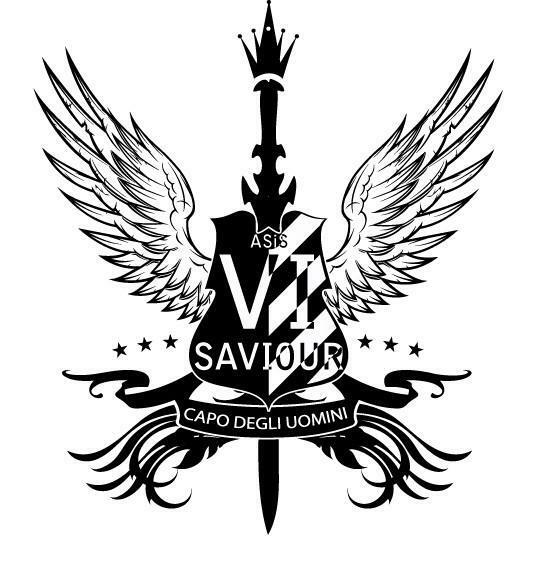 >.< Fortunately, I was able to revive myself and play my role well. While the interviewers bombarding my group members and I questions, again I failed at brain storming and my group members kept on supporting each other's back. Thanks everyone! Well I think my group did a great job, and our project plan seemed to be perfect, except for some really specific details that we missed out. Plus, everyone of us never literally cooperated with each other, and never planned nor did any project of such, which involving lots of people in the community. 4/5 marks seemed to be good enough for us, and hopefully everyone would succeed in securing this prestigious scholarship. bt hey u also like purple! High5! Yeah its long, I have spent 3 hours doing it though! :P Good luck to you too!